GRACEkids is just one way the church has the privilege to come alongside parents. Therefore, the goal of each aspect of our GRACEkids' Ministry is to partner with parents in SHOWING Jesus to their children so that they KNOW Him and GO tell others about Him! Click HERE to visit the Gospel Story website! If you have children, we provide care and instruction for kids ages 1 year to 5th grade. All teachers and helpers have to clear background checks and are MinistrySafe educated and certified. Classes begin after our cooperate worship service. Check-In for childcare occurs before the service starting at 9:30AM and is located at the back of the main auditorium. Children 6th grade to 12th grade stay in the main service and are invited to be a part of our ONE16 ministry. ▪ CRAWLERS: (ages 1 and 2) provides a safe, nurturing environment where children can play, and do some organized activities. 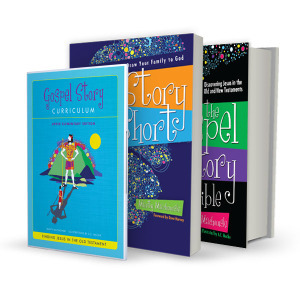 and RUNNERS (3rd-5th) receive age-appropriate teaching from the Biblically rich, Gospel-centered curriculum, The Gospel Story for Kids (pictured). If you have any questions about where to bring your children, feel free to ask a greeter!